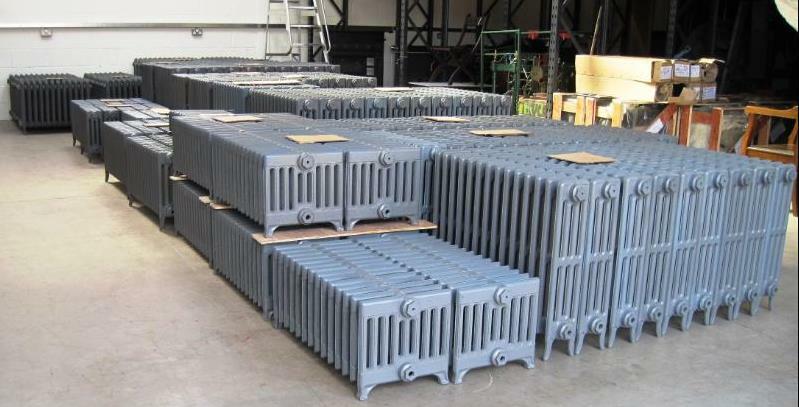 At UKAA we have just taken delivery of a stock of Carron cast iron radiators. These old style radiators arrive in a primer finish allowing you to paint them in the colour of your choice. All are fully assembled and ready for next day delivery. To compliment these beautiful radiators we also sell accessories such as thermostatic and manual radiator valves, pipe covers and wall stays. At UKAA we have a good quantity of Carron Victorian style cast iron radiators in stock ready for next day delivery or collection from our reclamation yard in Staffordshire. These antique traditional style cast iron radiators come with a lifetime manufacturers warranty and are fully assembled in a primer finish ready for you to apply the top coat. All our Carron cast iron radiators can be delivered worldwide, please contact us at the office for an accurate shipping price. We also have in stock the radiator accessories which include thermostatic TRV and manual radiator valves, radiator pipe covers and wall brackets to complement the cast iron radiators. Here at UKAA we currently have an offer on selected Carron cast iron radiators, towel rails and valves. *35% Discount applies to the primer finish only, additional finishing charges apply per radiator section. Here at UKAA we have a large selection of Carron cast iron radiators available for next day delivery or collection from our yard in Staffordshire. These traditional style radiators are made using Victorian moulds and have the look and feel of an old reclaimed radiator but come with a lifetime manufacturers warranty. The cast iron radiators can be delivered on a next day service if your order is placed before 12pm. These old school style radiators are available in a primer finish ready for you to paint in a colour of your choice. UKAA also have a vast selection of radiator valves and accessories which are suitable to use with all the cast iron radiators that we sell. We are proud to announce at UKAA we now have some new specialised finishes available for the cast iron radiators. These hand gilded and patina finishes include Antiqued, Aburstig, Gold Leaf and Virdi Gris, Gold leaf Aged Black and Gold Leaf Italian Aged Red. Here at UKAA we stock a large range of Carron cast iron radiators to go. All are assembled and available for next day delivery. These old fashioned style radiators are supplied in primer finish allowing you to select the top coat of your choice. All our radiators come with a life time guarantee and can be delivered anywhere in the world. To complement the range we also offer a choice of manual or thermostatic radiator valves. Come and visit our showroom at UKAA to view the exclusive range of Carron high quality bespoke cast iron radiators which are not only functional but also make a stylish accessory to any room. All our radiators come in a range of styles and finishes including primer finish, hand burnished, highlight polish, antiqued or sprayed in the colour of your choice. Once you have chosen your style and finish your radiator can then be bespoke made to your specifications. We also offer a choice of either manual or thermostatic radiator valves in a variety of styles and finishes to match your bespoke radiator.